A sister-in-law of mine makes really intricate chainmail jewelry by actually bending tiny loops of metal. It's beautiful. For a present I printed her three samples of 3D-printed chainmail patterns. (Although her real ones are uncountably more beautiful and complex!) 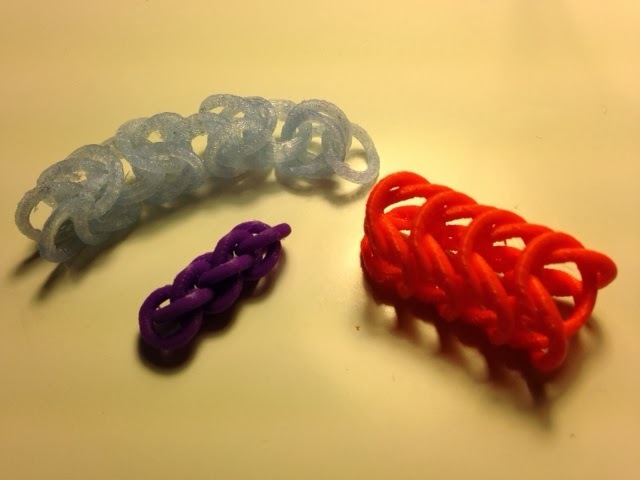 The designs are from TrenchCoatGuy's amazing Byzantine Chain, Box Chain, and Jens Pinds Linkage models on Thingiverse. Settings: Makerware special profile as described in Day 9 of this blog. The Byzantine took 28 minutes, the Box Chain took 24 minutes, and the tiny Jens Pinds Linkage took just 8 minutes. Stuff you might want to change: The support material takes forever to pick out and the model tends to stick together. The special profile helps - with no support the model has broken bits with angel-hair, and with standard supports the model is too solid to pick apart - but it still isn't enough to make this viable for me on a Replicator 2 machine. I think scaled-up models would probably work better for my equipment. Beautiful models, though, and amazing that TrenchCoatGuy could create them!